This versatile multipurpose jacket and vest from Scottevest is one of the superior tech and travel garments ever. The $150 you spend on a Tropiformer will be the best purchase you make for years to come, due to the lightweight fabric, removable sleeves and hood, and a zillion pockets. Fit, feel, and finish are first-rate. If you live, work, or travel in warm parts of the world, you will immediately value Tropiformer’s bulk-free protection from the elements. For everyone else in every place else, this jacket/vest will get regular use during summer months and seasonal transitions. iPad stowage and usage are easy with the included dedicated jumbo internal pocket. A very clever hood placement allows for head protection when needed, and hood removal on the clearest of clear days. Additional internal and external pockets, zippers, zones, and velcro are built into Tropiformer and all Scottevest garments. If you own it and you want or need to carry it on your back, it will fit comfortably into this jacket/vest without you looking like a pack mule or a Transportation Security Administration refusenik. Breeze through airport security with all your techie toys and metalware safely zipped into place, while your jacket is placed in one of TSA’s designer X-ray buckets. Sleeves attach and remove from the vest section via quick-position magnets. The sleeves can easily be stored in another special pocket when using Tropiformer as a vest. The company’s “second skin” claim is accurate. 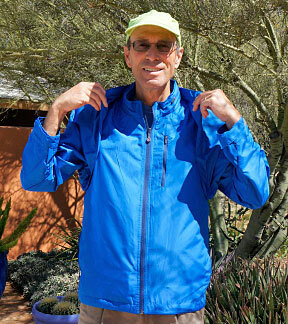 I’ve been wearing our evaluation Tropiformer outdoors in the hot and windy May weather of southern Arizona without sweating, overheating, or exposing my precious skin to dangerous solar radiation. My blue demo Tropiformer is “attractive and stylish,” according to the fashionista Mrs. Nemo. It holds a lot or a little, as needed, and it immediately moved to first hanger prominence in my closet. I have several other Scottevest jackets and vests, and during the long summer and vacation season Tropiformer will be my constant companion. It folds up into a tiny bundle, and can be rolled back into itself when out of service. The $150 price tag is extreme value. Tropiformer shares the award for Best Jacket/Vest Ever with Scottevest’s Fleece Jacket 7. You can read our MyMac reviews of the company’s other outstanding products here. Congratulations on everyone at Scottevest for developing Tropiformer.